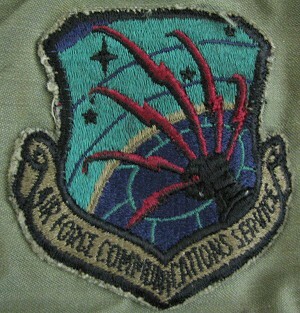 1978 through 1982 marked my years spent in the U.S. Air Force as an Air Traffic Control Radar Technician, AFSC 303x1. After nine months in technical school at Keesler AFB, MS, I moved on to my permanent duty station at Robins AFB, Georgia. 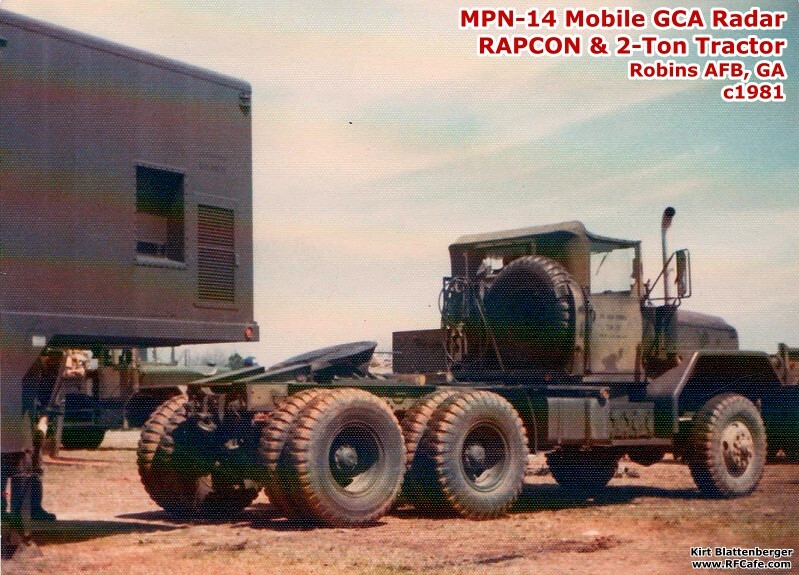 The AN/MPN-14 was a mobile radar system that consisted primarily of an Equipment Trailer (all of the radar electronics), a Maintenance Trailer (workbench, AC/Heat, UHF/VHF radios), and a big RAPCON Trailer (ASR and PAR displays and controls). 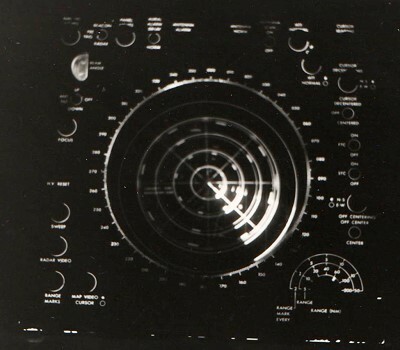 A 60-mile Airport Surveillance Radar (ASR) and a 10-mile Precision Approach Radar (PAR) provided the primary radar, and a 200-mile Identification Friend or Foe (IFF) system provided the synthetic (secondary) radar. This IFF system contained a 1 kbyte magnetic core memory with the four read, write, sense and strobe lines threaded by Pygmies. These pictures were dug out of a photo shoebox and posted for your viewing pleasure. 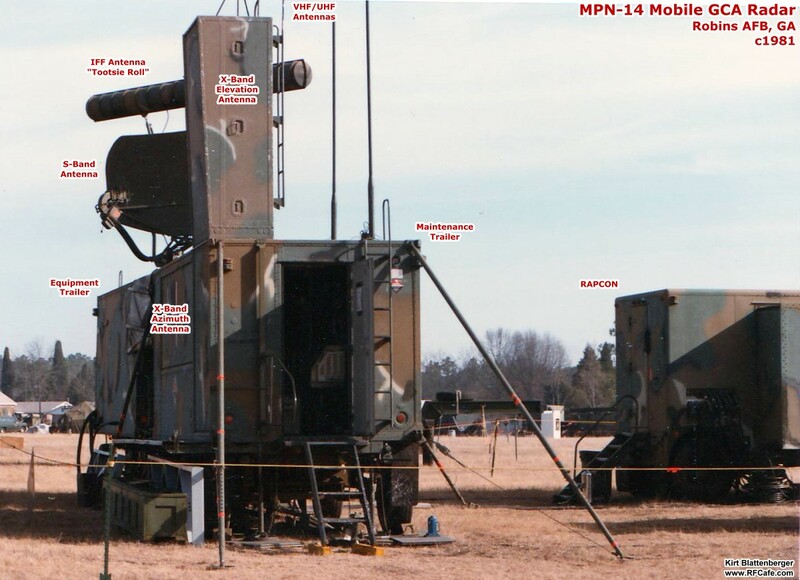 A search on Google for the MPN-14 radar turned up no pictures at all, so maybe this is now the only one on the Internet. Due to the huge amount of interest in the 5CCG (5th MOB) both my 5th members and by members from other Mobs, the scope of this page has been expanded to include all the MOBs, the first through the 5th. If you or someone you know was a member, please contact me with your service information and I will include it here. Photos are welcome; I can scan originals or negatives and return them to you if you do not have digital versions. Tobyhanna Reporter article on an AN/MPN-14K transformer modification to prevent arcing. Click here to learn how to find patches and other paraphernalia from your military history. Here is a friendly letter I received from the VA. The GI Bill had been suspended during my enlistment era, so I had to pay into the college fund. 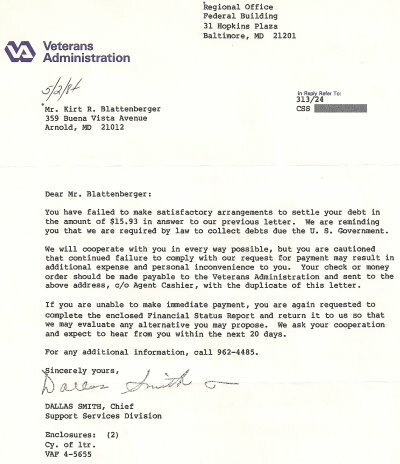 Turns out, the VA had it wrong, and I did not owe the $15.93. Here is the official 5CCG Alumni Association website. Sign the guest book and have a look around. MOB histories are quite extensive, and most have been moved around over the years. The links below take you to the most useful sites I could locate. If you know of better ones, please let me know. Formerly called "The AACS Alumni Association"
ITT/Gilfillan (then Exelis and now Harris) has "resurrected" the MPN-14. It appears from their brochure that they have gutted the shell and re-fitted it with modern electronics and software - very nice!. I just hope they have significantly improved the air conditioning system as well; that old design used to fail continuously. Thanks to Angelo V for the info. Operations Trailer nearest in photo, Maintenance trailer inline and connected to the rear, RAPCON separate and to the right. 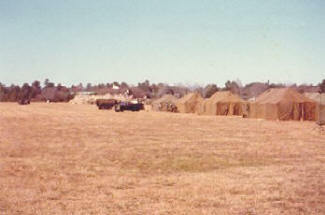 ASR & IFF antennas toward center of trailer, PAR Elevation antenna nearest - circa 1979-82. Backing up the tractor to hitch up the MPN-14 RAPCON for a deployment - circa 1979-82. "Healthy Strike" deployment cantonment area, Herbert Smart Airfield, Macon, GA. - circa 1979-82. 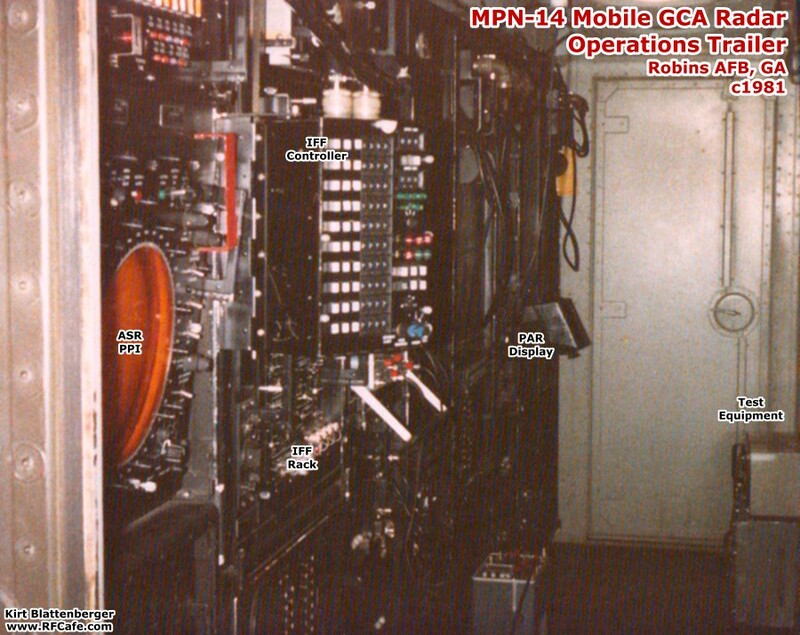 Inside the Operations Trailer. ASR display nearest door with IFF control box next to it. 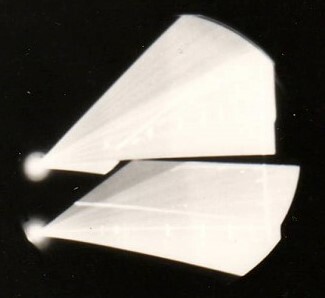 PAR display near the arm protruding by door - circa 1979-82. 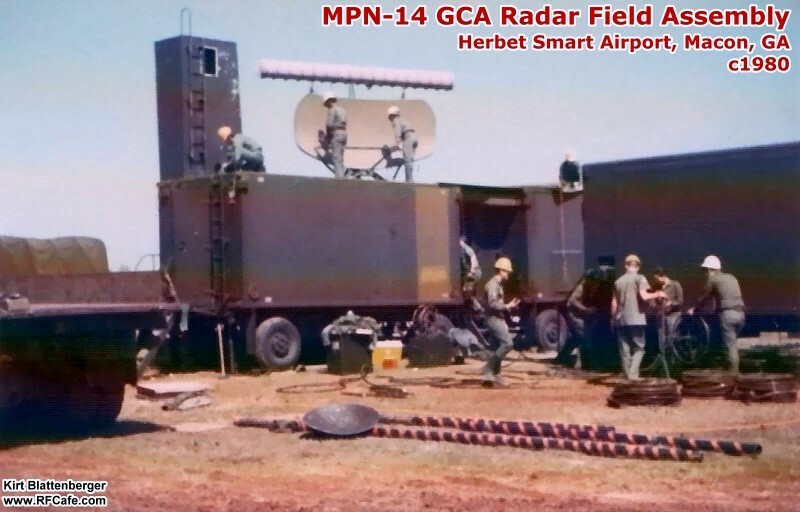 USAF radar tech Elbert Cook has completed his scale model of the MPN-13 GCA (Ground Control Approach) mobile radar system that he worked on. It has an incredible amount of detail, including the ASR (airport surveillance radar) and PAR (precision approach radar) antennas, the VHF and UHF radio antennas, navigation hazard light, and even the gin poles that stabilize the trailers against wind forces. Elbert's modeling skills are impressive indeed! Hopefully, this model will someday end up in a USAF museum - maybe at Wright-Patterson AFB. 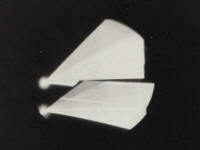 B&W photo of ASR display (PPI, top right) - circa 1979-82. AN/GPA-131 Analog Video Mapper overlay display can barely be seen on the monitor. 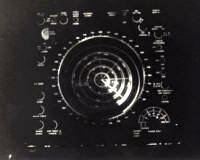 B&W photo of PAR display (bottom right) showing Elevation display at top and Azimuth display on bottom. Yes, it is in dire need of alignment - circa 1979-82. 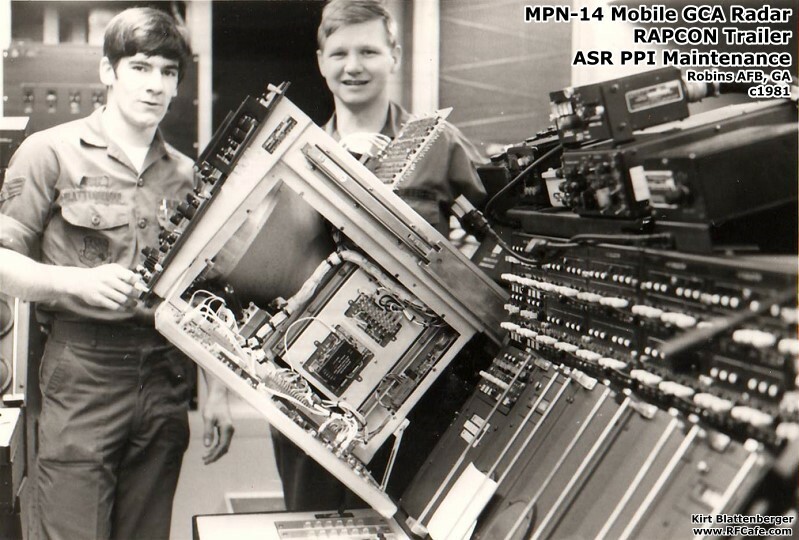 Members of our radar shop assembling the MPN-14 (one of two we maintained, left). In the picture are Chuck Powell, Ron Dames, Don Hicks, Linda(? ), Ed Nugent, Allen Coker, Scott Breen(?) and Supreme Commander TSgt. 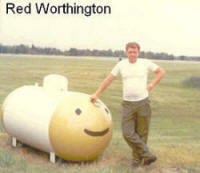 "Red" Worthington. I welcome feedback from anyone that wants to correct my identifications - circa 1979-82. Yours truly and Sgt. Ed Nugent (right) inside the RAPCON performing a display alignment - or at least pretending to - circa 1979-82. 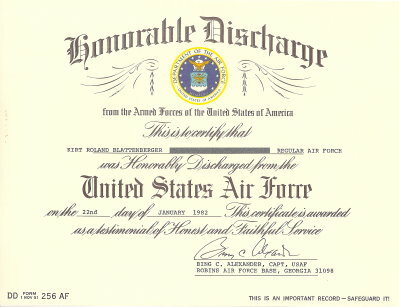 Gary Thomas <service> - I was inducted in the Air Force March 1968, after Lackland (now merged with Randolph AFB into Joint Base San Antonio) I was sent to Keesler for for 303x1 training and then assigned to the 1926 Comms Sq. at Robins in Dec 1969 and stayed there for the rest of my term of service 1971. We had a FPN/16 on a turntable and worked out the FAA Rapcon bldg. The TSgt. was Victor Sharp, SSgt. Calvin Oberg, Sgt. Ronald Vaughn. Soon we were joined by Nathan Lemmon, and Larry Gulley. Not long after I arrived Gilfillan came and did a complete rebuild of the unit including turntable. We then had a very light work load for the remainder of my time there, due to all new equipment. 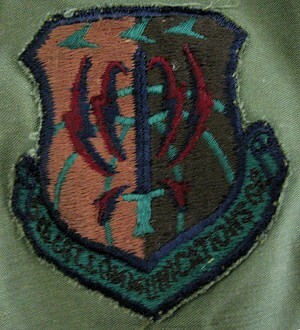 Rich France <service>- Radar unit#5 was assigned to me.. gulp!... either you guys could train on it or I caught Hell!. FPN-47 (there were two units in the same room that fed one antennae out by the trailers. I was one of the few that trained on the BRITE system – that came to Keesler before ANY other site in the world (including the Pentagon) – we trained oh so many officers for a year or so then enlisted men – with two maintenance staff on 24 hour stand-by- when anything was ordered for that system, it was flown directly to Keesler and delivered to me by the pilot! I welcome a contact from other radar guys from the 1960s/1970s. Rick Tenney - The Commander was Col. Madera, and the Radar shop NCOIC was MSGT Richard Jolley. 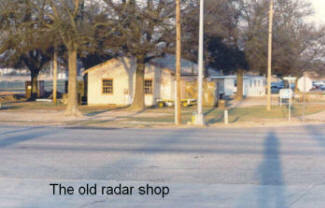 Other RADAR Maint personnel I worked with were Larry Gulley, John Peysur, Norman Cole, Wayne Sutton, and Bruce Blackburn. I found Bruce Blackburns' listing on this web page so most of the data is the same. I was sent to King Salmon Alaska in 1972. It's good to hear about long lost buddies. Thanks to Don Hicks and other former Radar Techs for many of these names. The list originally reported only 5CCG Radar Shop members, but has been expanded to include any AFSC 303x1 Radar Techs who care to send in their information for a listing. Send me an e-mail to have your name removed, or to add others to the ever-growing list. If you were ever a member of the 5CCG radar maintenance shop, please send me an e-mail and let me know the dates you were there. I would like to use this space as a group gathering for all the graying heroes of yore. Thanks! Col. John Kopsick, Jr., was the 5CCG commander from Mar 78 - May 81. His photo looks like the hero star of a WWII movie. - Kwang-Ju AB, ROK, 1988 to 1990. Unit designation changed from 4th CCS to the 4th CCG, radars with units in Japan (441th CCS), Korea (442nd CCS), and the Philippines (443rd CCS). - RAF Lakenheath, UK, NCOIC of Radar Maintenance, Jan 2001 to ? - Retired Feb 1997, MSgt. - Soto Cano AB, Honduras for a 4 month TDY to give the Mob some relief maintaining the MPN-14. 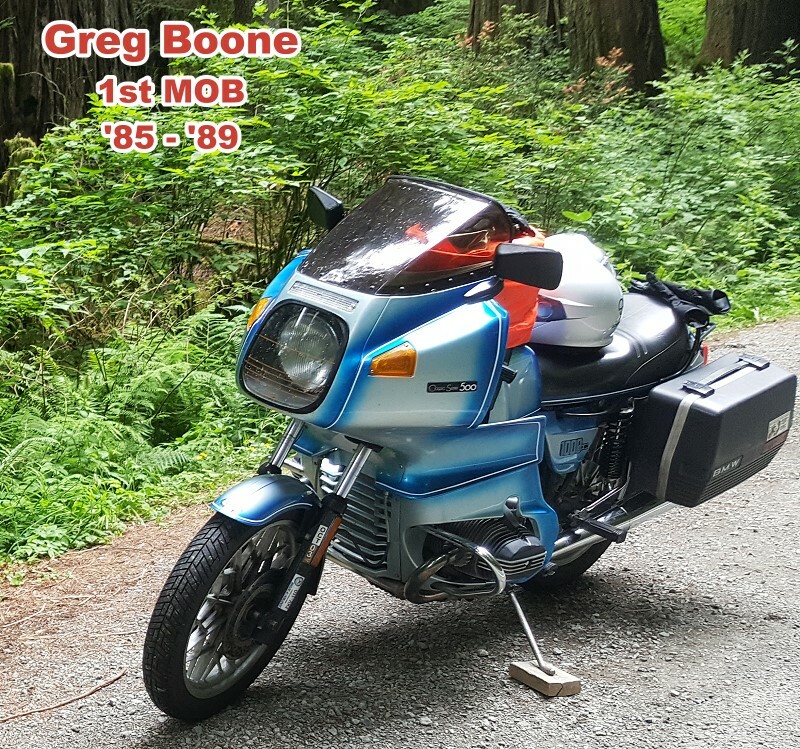 - Now permanently retired in CA - lovin' every minute of it. - 5CCG (then the MCG - Mobile Comm Group) Nov 1970 to Nov 1973. Three MPN 13's (sn#s 154, 162, 192) and one MPN 14 with Rapcon trailer sn#127. 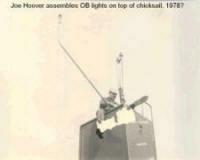 The Commander was Col. Madera, and the Radar shop NCOIC was MSGT Richard Jolley. Other radar maintenance personnel I worked with were Larry Gulley, John Peysur, Norman Cole, and Wayne Sutton. FPN-47, FPN-16, FPN-62, GPN-20, Brite-II, GPA-133 Mapper, TPX-42, MPN-13, MPN-14,T-4 trainer, TPN-19, assorted radios, the old 302 phone system and ancillary equipment. - MPN-13, MPN-14 and a one of a kind MPN-17 developed for use in Vietnam at Phan Rang AB. The MPN-17 had 2 Search frequencies at different phases so as to eliminate excess ground clutter. - 3CCG, Tinker AFB, OK, Jun 1973 - Apr 1979. "I thought I must be in for a good deal. Boy was I wrong. "MPN-13, MPN-14, TPN-19 (qty. 10) and all the equipment that went along with them. Went to TPN-19 school and factory in 1975. "What a mess. There are some war stories about them." 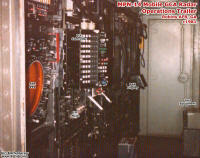 - Shemya AS, Apr 1979 - Apr 1980, MPN-13 w/o a 301 key system, T3 Trainer. There was all kinds of room in that power trailer. Our UPX-6 was not restricted to 60 miles. 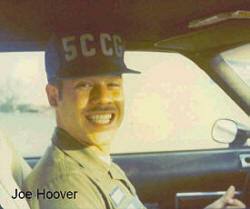 - Holloman AFB, NM, Apr 1980 - Dec 1984, FPN-47, FPN-16, Brite-II, GPA-131. Then to Quality Control. 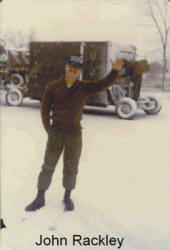 - Langely AFB, VA, Dec 1984 - Jul 1988, Air Traffic Control Radar Functional Manager for TPN-19s. Dec 1984 ~ Jul 1988. - Retired 1988, got two degrees, worked for OKC hospital for 14 years then retired there. - Build model airplanes and working on scale MPN-13 model. - Graduated w/BSME in May 2006 - congrats! -- "Old radar troops never die, they just 'Phase Array'"
- Retired: Zaragoza, Spain, 2001-? 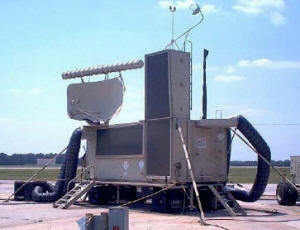 - Air Traffic Controller (AFSC 27250), 4 years all as radar controller. - 1 year at Udorn Royal Thai Air Force Base. - 26 years at FAA as controller, at Huntsville, AL and Louisville, KY.
- Ernest-Harmon, Newfoundland, AFSC changed to 30351, MPN-1. - Tinker AFB, 3CCG, NCOIC of largest radar section in AFCS, MPN-13, MPN-14 (& world's first 12, TPN-19s), 1974-76,retired MSgt 1976. - Benchmark Electronics, 1994 to 1995, Clute, Texas, Quality Assurance Mgr. 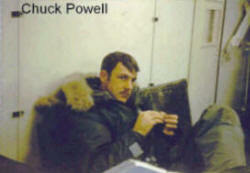 • Separated from the USAF on 19 Nov 1980. - USAF Reserves, Wright-Patterson AFB, OH, 1977 to ? - Now working for FAA in Oklahoma City. - TPN-19; 54 CBCS, 1994 – 98 / 2002 - 03, MSgt Ret. - Jim dates back the farthest of anyone in this list! • John Pensko, SMSgt, ret. - Retired at Robins, spent 25 years as functional test inspector for Boeing. Retired and loving it. - 52CCS Robins AFB for TPN19 shop with Steve Haynes in 1994. Bright star in Egypt, and multiple trips to Prince Sultan. - Retired 1997, working as a Network Design Engineer for a defense contractor. • Andrew Wilson, MSgt, Ret. - Presently a WG-2610-12 at Gyro Shop, Bldg 158, Robins AFB.